"Of all kinds of satire, there is none so entertaining and universally improving, as that which is introduced, as it were, occasionally in the course of an interesting story, which brings every incident home to life; and, by representing familiar scenes in an uncommon and amusing point of view, invests them with all the graces of novelty, while nature is appealed to in every particular." So begins the Preface to Tobias Smollett's debut novel, Roderick Random (1748). 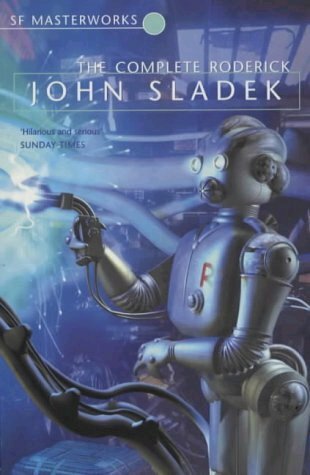 Titular similarities aside, John Sladek's Roderick, or the Education of a Young Machine (1980) and Roderick at Random, or Further Education of a Young Machine (1983), collected in this entry in the SF Masterworks series as The Complete Roderick, bear many similarities to the eighteenth century novel's form. The structure of the work is episodic, with a panoply of robustly picaresque characters populating its 609 pages and driving the colourful life of its 'Candide-like protagonist' (Clute and Nichols, ESF, p. 1114) forward. There are no shortage of playful homages to the eighteenth century novel's experimental forms, and some of the typographical jouissance the reader encounters in The Complete Roderick serves to confirm at least one oft-cited similarity between Sladek and Kurt Vonnegut. We get to read the University of Minnetonka Special Emergency Finance Committee Voting Record Part 189077 (p. 73), see what the decision tree that Roderick sketches in school looks like (p. 161), can study the solution that the robot mails to to the publishers of the murder mystery paperback Die Die Your Lordship (p. 339), review Roderick's mapping of the story of Abraham and Isaac as a flowchart (pp. 248-50), puzzle over Ma's (who turns out to be Pa, p. 312) mirror writing (p. 294), and consider the truth tables with which he simulates (with the help of a partner) the mental processes corresponding to sexual experience as the puzzling mind-body barrier that the sexual act in part is (p. 378). The fact that the titles in their current form were intended to be concluded by a third volume that never appeared gives some intimation that the works as presented may have been considered to be less than wholly successful by their author. Sladek seems to take as much delight in satirizing the dull, drugged, repetitious nature of the exhaustive comparisons of the effects of prescription drugs and tendency to list things endlessly that characters indulge in as he does in the endeavours of his protagonist to find his way through his world, which perhaps goes some way towards explaining why the final entry to the trilogy was never forthcoming. Sladek may simply have lost interest in his robotic creation, and those readers that manage to finish the work in this two-volume form might be able to see why. The reader comes to feel that the work is less about the coming-to-consciousness of a robot than it is about the reader's coming-to-consciousness of the dehumanizing, robotic nature of contemporary life. The novels are set in a present that seems adjacent to our own, but slightly more desensitized: a little more hopped up, even more suffused with corrosive advertising, and prone to iterating litany-like lists as passive viewers rather than active interpreters: "we've traded away our reality. We have no past, no future, no minds, no souls" (p. 445). The novels have a propensity towards self-referentiality that find their fullest expression in the relationship that Roderick develops with Father Warren of the church school that he attends who, like most of the other characters in the work, seems incapable (in keeping with the novel's thematic interest in comprehension per se) of recognizing the robot for what he is, or for getting his name right: "I, Robot by Isaac Asimov. Tried that yet? Here, take it along" (p. 224). The naive but logical and incisive questions that Roderick asks of Father Warren unbalance the latter's sanity to the point where he begins to pick stigmata in his hands, and Sladek introduces some interesting perspectives on programming, religiosity, and autonomy. Religion is given a thorough working over by Sladek through the Roderick titles, perhaps to most amusing effect in the description of the costume that Ma, the robot's surrogate mother, creates for his nativity play to the horror of the audience (p. 243). Whilst it is never spelled out quite so synoptically, the books have a proclivity for obsessing over what we might call the 'autonomy of automata', most notably in a sequence on pp. 327-28 that iterates historical studies of the 'revenge of the common man upon the common object' when automatons have suffered at the hands of their creators or been otherwise abused. Sladek's parallel representation of the impulse-oriented nature of the behaviour of the characters he has created invites the reader to extrapolate from these passages in order to consider the lack of will that the human-as-consumer manifests in failing to resist the tyranny of the object over the subject - the possession's possession of the possessor: "we must smash the machines inside us, smash the idea of the machine" (p. 489). "If you think machines are trouble, just look at the dumb bastards running them" (p. 491). "Everyone's[...] so obsessed with our machine world they think we have to be machines to fit into it"" (p. 555). A cleverly allusive work that makes playful reference to everything from the Andrex puppy adverts (p. 393) to Conrad's Heart of Darkness (p. 571), The Complete Roderick is a likeable but neither especially engaging nor particularly profound entry to the SF Masterworks series which may be recommended if not for its plot, style or ideas then for its not taking itself too seriously: 'the world was beginning to resemble something in a satirical science-fiction novel of no great quality' (p. 401); 'left, right and centre, it's all a great big nothing!!!' (p. 399).